Ableton users often come across as the real die-hards upon the endless DAW vs DAW battlefield that spans forums and social media. It seems like Ableton owns something of theirs, a part of their music-making soul that no other DAW can truly claim! 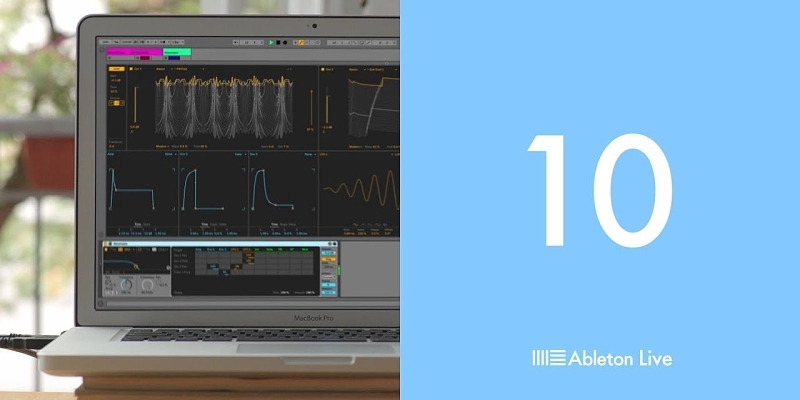 Now, after 4 and a half years in Ableton’s development workshop, Live 10 emerges with some key changes and additional devices which could see it claim yet another generation of digital music-makers. Readers who are already Ableton users might understand this fanatical love-hate and love again relationship that surrounds Ableton, or, they might just think that Ableton is a pretty damn cool piece of audio production software! Whichever way you look at it, Ableton has captured the imaginations of a generation of musicians since it emerged from Berlin in the early 2000s. It continues to occupy that awkward spot between DAW and DJ/performance software. It really has redrawn the lines between songwriting, composition, DJing and live performance. The thing that separated Ableton from the status-quo? The key is in the name – Ableton Live. Ableton was originally designed with live performance in mind and this is still why it fills out a rather unique space in the audio industry today. It can seamlessly integrate your studio projects into exciting live sets. Now, it’s not just decks, CDs and USBs that fill the stage at venues and festival stages but PCs and Macs, too. Ableton 10 still flies this flag – it consolidates Max For Live into Live for seamless integration between the two software entities. Ableton has always taken a slow-burning approach to updating their software and though we’re now on Ableton 10, it was 4 and a half years since 9 was released. In that time, a lot has happened in the world of production and live performance and other players have grown, particularly Native Instruments. Armed with all manner of creative hardware and studio tools like Maschine to back them, tempted Ableton users have looked for a response from their favourite developer. Ableton 10 has seeked to reclaim ground lost in this period of lacking innovation – that’s exactly what Ableton 10 has done. Live 10 comes in a Standard €349 package and a €599 Suite package. The differences include bundled sounds, which have been updated considerably with tons of extremely useful contemporary additions. The suite contains 70GB of sound files and the standard version contains just 10GB. Also, the number of devices differ (47 vs 69). Also, Max For Live which is built into the Live app only comes with Suite. The bottom line is, Suite contains a lot of extra ‘stuff’. It’s worth the extra money. Ableton 10’s graphical changes are subtle but tasteful. It’s clean, modern and easy on the eye with a new font and some extra modifications like coloured clips (rather than just their titles) and colour-matching MIDI notes. In the new Collections bar you can now find seven coloured categories named ‘filter folders’. Here, you can place anything ranging from devices to plugins, presets, projects and more. Simple but useful. Other arrangement changes have occurred to the Arrangement View itself which is now modal. You can switch between different modes of view. For example, It’ll now show clips with MIDI notes and waveforms but not automation data. So, there’s no automation lanes positioned under track names. To switch to full automation view, you hit the a button. The benefit of this is that it’s easier to edit clips when automation is hidden. It’s cleaner and less crowded. Another key change is that Live now allows you to edit eight MIDI tracks at once from within the Detail view. You can switch between clips for simultaneous editing from within the same view. The clip you’re editing will be coloured in whilst other clips remain greyed out. The headline feature upgrade of Ableton 10 is without a doubt the new devices/plugins. Most of these only come with the Suite. This is Ableton’s new synthesizer and it’s an admirably ambitious attempt. Its main features include two wavetable oscillators. With filters, envelopes, FX, LFOs and an additional sub oscillator, this is a powerful synth with a great UI. It looks lovely too and is completely continuous with Ableton’s UI. Ableton has overlooked building a native synth like this so it’s great to see one with Live 10. Wavetable has a large library of sounds which are sorted into 11 categories. You can load samples into the oscillators and start twiddling knobs or use presets to start experimenting. Modulation is possible via a comprehensive matrix and virtually every other feature you can imagine is present from envelopes to LFOs, FX racks and more. Wavetable can produce sounds that range from long and complex pad-like soundscapes to hard-hitting bass and leads. It’s very well-built and comes with tons of options. It has two oscillators and a sub oscillator so it won’t quite match up to synths like Serum but it’s different and will offer something new to your sessions. Live already has stacks of delay effects built in which range from multi-delays to ping-pongs and granular effects but Echo breaks some new ground. It draws inspiration from tape delays but it has a fair few novel features which will likely see no end of use. It features a pair of LR delay lines that can be set with MS or BPM interval delays. They run into a filter where you can modulate LFOs and are then processed in a final stage for adding various characters to the sound. So essentially, it’s a 3-part process: ‘echo, modulation, character’, as you can see below. Echo has some cool graphical features including its visual ‘echo tunnel’. This is actually very useful – you can see how your delays move according to their intervallic syncopations. You can also click on the graphic to see and hear the changes which is awesome! It’s great to have a simple but useful little graphic like this within an echo-style delay. Echo can mimic old-school tape machines and can produce grinding wide delays or dub delays with ease. It’s great for creating interesting textural sounds that evolve via the use of feedback and reverb. For a small and simple plugin, Echo will see tons of use in the sound design department. A real triumph! Live Suite also contains Pedal which is a classically inspired distortion pedal for guitars. It’s simple and features three separate modes. You can get classic vintage overdrive or any level of fuzz or distortion that ranges from warm to brutal. You have a compressor and 3-band EQ with a few extra settings – nothing too complex here. Pedal can produce some lovely analogue-style distortion and that’s what it excels at – its sound quality. It’s been designed with the actual end-result distortion in mind and can give shape and body to any sound you pass into it without it sounding flabby or outdated. Drum Buss is a drum-shaping toolbox for enhancing drum sounds with simple, easy-to-use and familiar options and settings. You can apply drive to your input and then distort its output for crunch. It also features filters that include a resonant low-pass that can boost your bass presence. A great option here is the ability to pitch-match your resonant bass frequencies to the pitch of a MIDI note (say your bassline), to ensure that your kicks are in tune with your track! Wavetable is great – it’s easy to use, effective and very capable of modern sound synthesis. Ableton 10 combines lots of smaller tweaks with the addition of major new devices. The result is neither too different nor too similar to Live 9. It features a rather subtle balance that will entice new users in with its updated sound library and exciting in-the-box synth and recapture age-old Ableton diehards that have jumped ship to Native Instruments. The downside? You’ll have to pay for the Suite option to get the most out of Ableton and it’s as expensive as it’ll always likely be. Still, for those who can afford it, 70GB of sounds combined with Ableton 10’s new devices rate it highly amongst any DAW and live performance software. Also, as far as live performance is concerned it’s still cheaper than buying a full NI DJ rig and Maschine, etc. Since when was music production a cheap affair anyway? You get what you pay for..